Our thoughts and wishes go out to his partner Vivienne as well as to his family and friends at this very sad time. Flowers will be from family only, donations will be acceptable at Paul’s funeral made payable to the Stroke Association or to The British Heart Foundation. On behalf of all at British Shohin Bonsai and also at the former British Shohin Association, I would like to add that Paul and Vivienne were staunch supporters of the BSA and Paul’s fantastic scrolls were a regular feature at our shows. There have been many award winning exhibits in which one of Paul’s scrolls has formed an integral part of the design – my own included. And of course Paul was instrumental in setting up the BSA Show book we produced a few years ago – a task we would not have achieved without his skill. We will pass our condolences to Vivienne but nothing can possibly describe what she must be feeling right now. 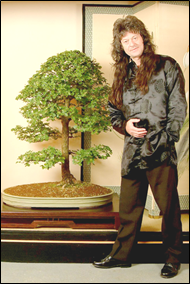 I hope there will be some event in the future to mark Paul’s immense contribution to bonsai in the UK. For the moment, let us remember this bonsai “great” for his skills and also for his incredible personality and off the wall character.